Sailing Federation Will Test Waters For Viruses In Brazil's Olympics Venues : The Two-Way The International Sailing Federation says the move is prompted by concerns over athletes' health and safety, after reports of raw sewage and trash in the water around Rio. Concerns about pollution in the waters around Rio have prompted the world sailing federation to take action ahead of next year's Olympic Games. Here, garbage is seen on Bica Beach, on the banks of the Guanabara Bay, with the Sugar Loaf mountain in background, earlier this year. 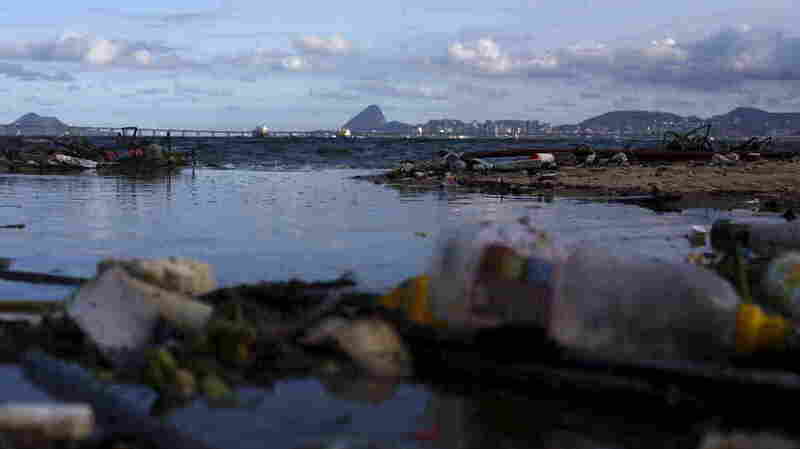 Saying that recent stories about raw sewage in Brazilian waterways that will serve as Olympics venues in 2016 helped "wake us up again and put this back on the agenda," the head of sailing's world governing body says his group will test for viruses and bacteria in the water. The International Sailing Federation's chief executive, Peter Sowrey, tells the AP that the move is prompted by concerns over athletes' health and safety. The news comes days after the AP published a report on pollution in Rio's Guanabara Bay, the scene for sailing competitions in next summer's Olympic Games, and Rodrigo de Freitas lake, which will host rowing and canoeing events. "We found that viruses linked to human sewage are present in the waters around Rio de Janeiro in astronomically high numbers," the AP's Brazil bureau chief Brad Brooks told NPR's All Things Considered this week. He said that in one area, the levels were "1.7 million times the figures that you might find on a beach in Southern California." The Summer Olympics in Rio won't start until next August, but athletes will be sailing there later this month, as part of an Olympic test event. The ISAF's move to examine the water independently is an escalation of a previous plan, in which local authorities had pledged to build "ecobarriers" to keep garbage from floating into competition areas. The ecobarrier plan was a response to a test event held in 2014, after which sailors told the ISAF that they were concerned that objects floating in the bay would interfere with races. Earlier this year, two Brazilian sailors who were training in Rio's Guanabara Bay saw their boat slam into a large plastic box in the water, capsizing their boat. "The impact broke the daggerboard, damaged the hull, and as we turned we fell on top of the sails and scraped the two sails. The damage was very significant and it is just unacceptable," one of the sailors said, according to the website Sailing Scuttlebutt.